Can anyone point me to some high end tutorials on the Export persona and how to use it? It is clearly very powerful but it's making my head hurt trying to figure it out! Thanks but I have, of course, watched those and they don't go into as much detail or as advanced as I need. I can give examples of what I mean but I don't think defining it would help much. What I would like to be able to do is output as both a full size JPG and PSD at the same time to different locations. I don't know if that is possible but the attached screenshot shows areas of the Slices panel that SEEM to suggest it might be. I wonder what the Batch Builder is all about? Things like that. The advanced side of the Export persona. Thanks for this. I'll have to do some testing since it seems pretty confusing. Let me try to see if I can work it out. I'm not quite sure what you mean by your location information above. Might it read something like this? C:\Users\phil_\Dropbox\The Really Temporary Folder? Actually, when I do what is in the attached screenshot it still asks me where I want to put the file when I hit Export Slices. I'm clearly doing something completely wrong but I really don't understand what it might be. Can you help me fumble my way through this? I'm under OSX so I used relative Unix paths, if you are under Windows you have to try the Windows path style instead. - Further since pressing the exporting button will popup a "directory/file save" dialog and that one defaults to the last used directory on my system, I used relative paths in my above example. Sadly you've totally lost me as this is beyond my understanding. I wonder if anyone else can explain it in the Windows context or even show screenshots? Thanks a lot for your help and sorry I'm not really technically minded enough to understand what you mean. Actually, you don't need to supply the path name at all if you're willing to have all the exported files in the same directory. You'll get a standard Windows Save dialog, where you can navigate to the folder where you want to save the files. Actually, you don't need to supply the path name at all if you're willing to have all the exported files in the same directory. What I would like to be able to do is output as both a full size JPG and PSD at the same time to different locations. In my possible defense, I considered that xyz.jpg and xyz.psd are in a way different locations, as the original image is exported in two places. And if Phil is having difficulty figuring out how to direct the output to two different directories in one Export operation, he can at least get them into one directory easily, and move them as a separate step. Thus it solves the basic problem, though I'll concede it does not help with the education aspect. Guys you have to learn to use a console too and how to navigate to certain directory locations with that (good old cd - change directory), if you only use GUIs, you'll eventually become dumbfounded one day. Yeah, I was really hoping to be able to output to two directories at once as I can in ACDSee. I just remembered I have a Lynda.com trial month right now. Should see if they have anything on this. I'm assuming no one here knows how to help me? Is that right? Phil can console himself with that thought! I have a Playstation 4. Will that help? I'm assuming no one here knows how to help me? Is that right? That all depends on what further help you need, Phil. I think I'm still on the same question of how to use this interface! Well if it has a OS console mode why not. - However, if you open a DOS shell it allows you to navigate and tab complete paths etc., so it shows and completes for you valid and available paths here. You can then mark (select) and copy those over and reuse them in certain tools where you need those paths as text representations. Figuring out how to specify the path name. I think from your screenshots that you've figured out (1). For (2), as someone said above, I think all you need to do is put a \ at the end of the name you have there now, though I would also suggest that you avoid spaces in your directory names. And I would ignore the Batch Builder; I don't think you need the JSON stuff. I'm sorry, yes, the latter. The two formats I have got down. It's exporting to two locations that I can't work out on my PC. 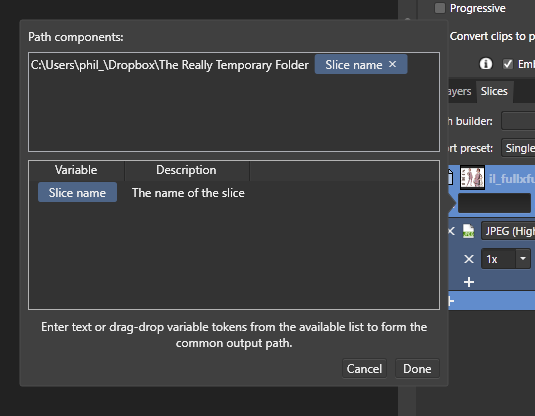 If you just use the (Slice name) variable and then the popup save panel, can you navigate to that location and does it correctly save a file there? Unfortunately I'm a photographer rather than a programmer and this is just gobbledegook to me.Ah well. It does indeed. 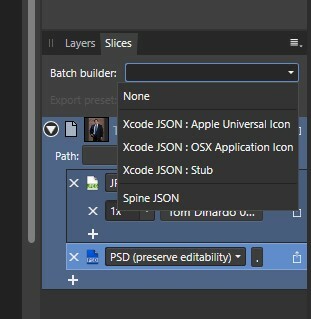 I drag the slice name over, close that dialog then hit Export Slices.